French Quarters offers the largest selection of fine 18th and 19th century antiques and accessories. Each piece is personally hand-selected by the owners, Chris and Storm, on their journeys throughout France. Chris uses her 25 years of experience as an antique buyer and interior designer to find extraordinary pieces of history and offer them at amazing prices. From the winding streets of Paris, throughout the countryside and tiny villages of Provence, they bring the flavor of the French chateau to your home. 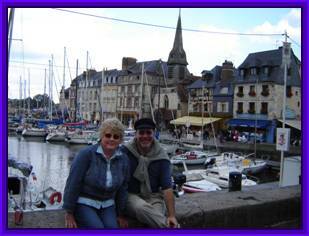 Chris and Storm in Honfluer on their last trip to France. Click here to see more pictures from their latest voyage.